After a Makani Kai aircraft crashed into the ocean off Kalaupapa last Wednesday, Makani Kai owner Richard Schuman said the Cessna Grand Caravan will be recovered this week. The Makani Kai flight departing Kalaupapa about 3:45 p.m. experienced “catastrophic engine failure” shortly after take-off, according to pilot Clyde Kawasaki. The plane went down about 1/2 mile off the peninsula. Eight on board survived, while Department of Health (DOH) Director Loretta Fuddy died in the water after exiting the sinking plane. Miller said Kawasaki was bleeding when he arrived on shore after being pulled from the water by Maui County Fire Rescue and Coast Guard personnel. Phillip Hollstein Jr., a 70-year-old Kailua man who swam to shore instead of waiting for rescue, credits Kawasaki with his survival, as he told KITV. “His control of the airplane is why we’re still here, as far as I can see. He did everything right,” Hollstein said of Kawasaki. Kawasaki has been flying for Makani Kai for one year, according to the company. He previously worked as a pilot for Aloha Airlines and has thousands of hours of flight time. Kawasaki was the last to exit the sinking plane, and even gave his life vest to one of the passengers, according to Schuman. While battling the rough water, Fuddy and fellow passenger DOH Deputy Director Keith Yamamoto were holding hands until Yamamoto felt her go limp, according to reports. Miller said by 4:30 p.m., seven passengers were accounted for but two were still in the Coast Guard helicopter. The male on board survived but Fuddy could not be revived. According to Miller, Fuddy’s body was taken to the care home in Kalaupapa while a priest came to say the last rights and some residents paid their final respects. 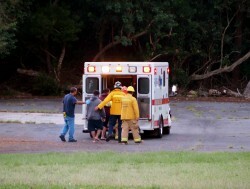 Her body was then transported to Molokai General Hospital. According to Molokai General Hospital staff, three survivors were also taken there, arriving that evening dripping wet, cold, hungry and most of all, tired. The hospital washed and dried their clothes, fed them and let them rest. The three reportedly stayed at Hotel Molokai, thanks to the assistance of the Molokai Visitors Association. Three of the other survivors were taken directly to Oahu, while two declined treatment, remaining in Kalaupapa, according to emergency officials. Miller called it fortunate that a military aircraft was doing touch and goes at the Kalaupapa airport around the time of the crash and reported the accident. Coast Guard and Maui County Fire Rescue personnel arrived in about 20 minutes and started the rescue operation, said Miller. “We set up triage station in the airport — everybody was there to lend assistance… with blankets, extra clothes and food,” reported Miller. Yamamoto was reportedly physically uninjured, and he and Kawasaki flew back to Honolulu on an airplane provided by Makani Kai. Fuddy and Yamamoto were visiting Kalaupapa for a regular DOH of meeting to meet with patients and employees, according to Miller. “Everybody loved her,” said Miller of Fuddy, calling her a close friend. Fuddy, in addition to being the DOH director, also acted as mayor of Kalawao County, the smallest county in the U.S., that encompasses Kalaupapa. 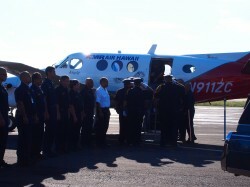 Molokai emergency response personnel gave Fuddy a final salute at the Ho`olehua airport Monday morning before her body was transported to Honolulu. The crash is currently under investigation by federal officials. The National Transportation Safety Board (NTSB) originally said the wreckage would likely be impossible to recover, but Schuman said the salvage effort will move forward this week. As of Sunday, Schuman said a salvage ship was scheduled to head to the site Monday and send divers down to rig slings on the sunken aircraft, after which cranes on the vessel will raise it out the water. He said the operation is dependent on the ocean conditions and the safety of the divers. In the meantime, NTSB investigators met with Makani Kai employees and examined aircraft maintenance and safety records. Schuman said his company, along with many other Hawaii air services, performs a variety of monthly diagnostic tests on their planes’ engines above and beyond federal and manufacturer requirements. An initial NTSB report on the accident could be released within two weeks. Makani Kai has been in business since 1988 and has both helicopter and airplane operations. Schuman said this is the first accident his company has had while carrying passengers. Meanwhile, Schuman said Makani Kai is continuing its regular flight schedule between Kalaupapa, Ho`olehua and Honolulu. The only change is that the company’s fleet of three Caravans used to include a spare, so now with only two aircraft, passengers may experience some of the delays routine for other companies, Schuman said. Makani Kai has been serving Kalaupapa for the last three years, with enthusiastic support from the community. The company is currently in the application process for renewal of a federal subsidy to continue service to the settlement. Three other airlines, including Mokulele, are competing for the Essential Air Service (EAS) appointment. Miller said Kalaupapa residents remain in full support of Makani Kai’s renewal efforts. The announcement should be made by Jan. 14.